« A very valuable hobby ! Okay, so you’re inspired to follow Sue Neall and sew a wardrobe in a weekend. Sue Neall made 2 tops, 2 bottoms, and 2 layering pieces (jackets). Most of us would find it more realistic to aim for making one of each. 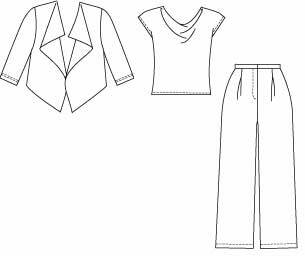 But anyway, you need patterns for jacket, top, skirt, and pants. – 4 hours each if making 6. Of course you can make 1 slow garment and 3 ultra quick ones 😀 but that’s the general idea. Most people who enjoy quick sewing do it by sewing knits using an overlocker/ serger. To widen the possibilities I’ve picked mainly patterns for wovens. colour : nudes, pastels, khakis, indigo blue, brights. fabric : sheers, denim, sweatshirt fleece, lace, leather. fabric pattern : striped knits, multicolour abstract prints, soft florals, african, batik, or animal prints. trim : big patch pockets, studs and metal buttons, lace, cord or ribbon ties. And ‘minimalism’ is ‘in’ this season, which means the simplest of styles made in high quality drapey fabrics. Co-ordinating is easier if you use a wardrobe pattern. So what wardrobe patterns are there ? 2018 update – few of these patterns are still in print, but it’s still worth looking at the line diagrams for ideas. New Look 6816, a 2-hour pattern for knit top, skirt and pants. There are very few ‘wardrobe’ patterns these days. Pull together a group of ’sewn in less than 3 hours’ patterns instead. 2014 update : Sadly nearly all the patterns in this post are now out of print. 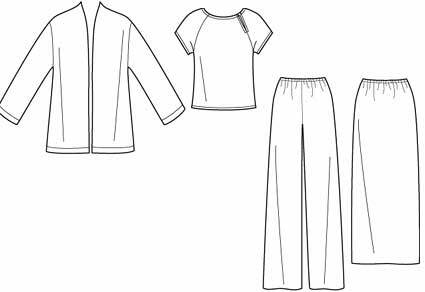 The line diagrams do give you an idea of the simple shapes with few style elements that you need to choose if you want to sew quickly. There actually are a few wardrobe patterns which the pattern companies claim can be sewn in a very short time. oop Butterick 5225 is a Life Style Wardrobe coded Easy rather than Very Easy. Butterick say it (presumably each garment) needs 2 hours of sewing time. 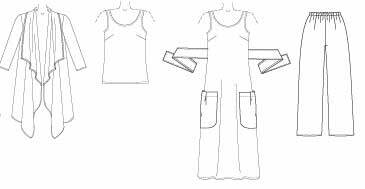 oop Butterick 5229 is a 2 hour pattern which includes tunic, dress, pants and jumpsuit. If you have even less time, oop Butterick 5226 is a 1-hour pattern for tunic, top and pants. If not using those timed patterns, it becomes more a matter of personal judgement. I think some of the Butterick Very Easy supposedly Fast & Easy patterns look as if they would take only a bit more time. I’ve picked ones with few seams and no buttonholes or zips. oop Butterick 5045 is a VE FE pattern including cascade style jacket or vest, dress, tunic and pants. oop Butterick 5363 is a Lifestyle Wardrobe that is VE FE. oop Butterick 4297 includes a very easy wrap rather than a jacket. 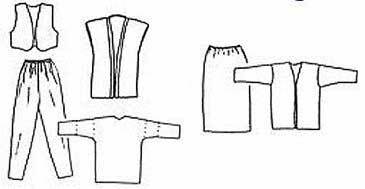 Also look at other wardrobe patterns to see if they can be simplified. For example, oop Butterick 5472. Make that drape jacket as a single layer without facings or lining – finish the edges with narrow hems or bias binding. 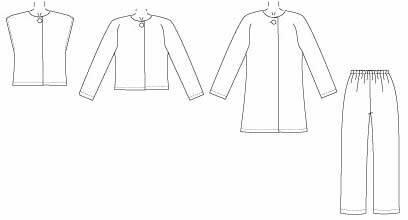 Or, the Butterick 5472 jacket is supposed to be made with bagged edge-to-edge lining of fronts and back. Would that be quicker ? And substitute elastic waist pants. If you’d like to button up, but don’t like making buttonholes, then try cord button loops. oop McCall’s 5298 is a scaled down version of oop McCall’s 5143, which included a thigh length jacket and full length pants – easy changes to make. 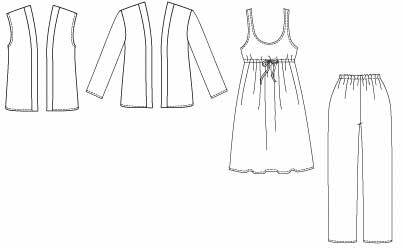 Or how about Butterick 4406, a VE FE sleepwear pattern which could work for general casual wear – shorten the robe to make jacket, 2 tops, and pants (and it’s still in print !). Ah, these patterns both have band collars. Would it be quicker to use a bias band neck edge finish ? Could you substitute button loops for buttonholes, or big snaps for closures, in other patterns ? oop Butterick 5190 is a VE FE Lifestyle Wardrobe for knits. 2018 – New Look 6816 is a 2-hour pattern for knit top, skirt and pants. Most independent pattern designers produce patterns for individual garments, but there are a few relevant wardrobe patterns. There are several very easy wardrobe patterns from Dana Marie – Purrfection. Such as Sophisticated Curves. Both these are still available. 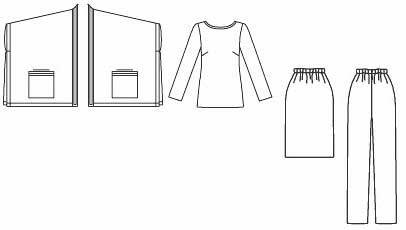 Obviously the best speedy pattern for you, and the simplifications you make, depend on what you’re happy to sew quickly. 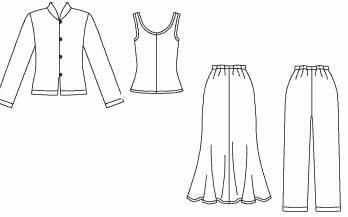 There are many other simple wardrobe patterns you can use if you’re comfortable with sewing buttonholes, darts or zips. Someone who has no qualms about zips may choose very different patterns from someone who avoids them. I get the horrors about making rows of buttonholes, but one of the wardrobe patterns said to take only 2 hours includes them. P.S. 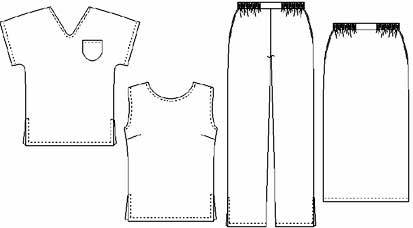 There are now posts on quick-sew patterns for individual garment types, see speedy sewing section. Most people who sew quickly use TNTs. If these patterns are new to you, you may need to adapt these simple shapes beforehand – so they’re more flattering for your body shape and more in your style. See my previous post. And of course, we don’t all enjoy sewing quickly. And we don’t all want to wear such simple shapes with so few style features. Though quality fabrics can make them special. Though these patterns do show much more variety than I was expecting. So choose what you want to do. This entry was posted on May 8, 2010 at 8:21 am and is filed under speedy sewing. You can subscribe via RSS 2.0 feed to this post's comments. Both comments and pings are currently closed. Waterfall jackets are quite ‘in’ this year and are super easy to sew. Thanks for the suggestions Ruth. I was just talking about wardrobe patterns in this post. I’m planning later posts, on patterns for dresses, tops, bottoms, and layers (yes, quick waterfall jackets !) And in the later posts, I’m planning to mention only patterns which the pattern companies give specific sewing times for. Which pattern are you referring to in this sentence: Or, this jacket is supposed to be made with bagged edge-to-edge lining of fronts and back. Would that be quicker ? I don’t think the number is listed or I’ve missed it. Thanks. Thanks for pointing out the problem Myrna. I was still talking about the Butterick 5472 jacket. I’ve changed the post now so it’s clear. Thanks for clearing up my confusion. I really like the collar on that jacket. Wonderful blog and post… giving me lots of encouragement to get started sewing again! Question: what is “oop” that I see near pattern names? I think I figured it out: “oop” = “out of print.” Ah, OK. Will look on eBay. Yes that’s right. Some of them are available at huge prices from BMV USA – better to try eBay ! hope you find them.